Well, I can not believe that 2013 is almost over, what a year it has been. First I will start with an update of my vacation, I went to Cocoa Beach for a cruise in the Caribbean. Goofy training did not stop because I was on vacation and I had some serious training to do that week. The highlight was meeting Kate in Cocoa Beach for a run on Sunday. I posted on a Facebook group I was going to be running in the area and did anyone know a route. Enter Kate who lives there and she suggested a route. I asked her if she wanted to run part of my 21K with me and I was delighted she said yes. Neale and I ran 11K first and Kate and I ran 10K together. I loved running with her so much that I said I would come back to run the Space marathon with her when she was ready. I had to do back to back 25k runs on Friday and Saturday on the cruise ship. Let's just say that running on a treadmill on a rolling cruise ship is not easy so on Saturday I did part of my run on the treadmill and part on the outdoor running track, that in itself had it s challenges but I finished 20 out of the scheduled 25K. Anyway, I got them all done and was quite proud of myself. As I type this I have done 11 out of the scheduled 12 races this year, 3 triathlons and 9 running races. 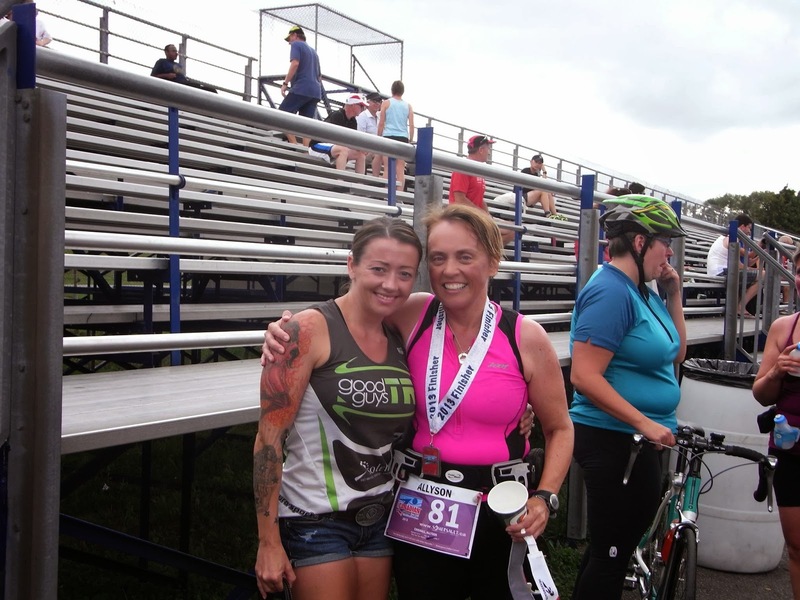 Each triathlon was a new distance for me and I completed my first marathon, another first. I got a PB/PR in each distance I raced and for the new distances, I did better them my anticipated time. Most important I learned a lot about myself and my abilities and that is what I will remember more about this year, this year was about proving to myself that I was worthy to be called a runner and triathlete. I learned to speak up for myself and what I need. I started the year with one coach and end it with another, I learned what I needed from a coach and would not settle for anything less. I want to say a huge THANK YOU to my coach Laura. Thank you for helping me achieve all my goals this year, it has been a blast and I can't wait to see how 2014 turns out. I learned to make lemonade out of lemons. Both Neale and I suffered injuries this year, his worse them mine but they both had an effect on my training plan. I was out of action for 4 weeks this spring and it played havoc with my training for my May races. I did manage to run them all but I knew I could do better. 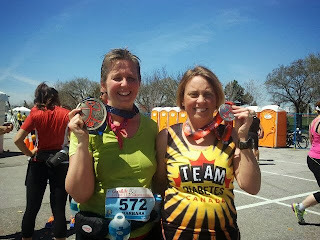 I was running the half marathon for Team Diabetes so that became my focus, finishing it for my friends who had diabetes. That was the plan but the night before the race, I found out my SIL died and I added her name to my shirt and ran for her that day. The last 5K I struggled but I kept going, thinking of her and as I crossed the finish line, I let my tears flow. Neale's injury had the biggest impact on my training, I ran the Army Run half marathon since he could not and I ran his marathon in October instead of us running my first together in Philly in November. In the end it turned out to be a blessing as I ran a PB for that half and had the best first marathon experience, better then my expectations in a fabulous city with fanatic crowd support. Running is better with friends and I have the greatest running friends. After doing most of my training solo for the first 6 months, I signed up to be a marathon group leader his summer. I was looking forward to running with people, to share experiences and stories and km...lots of kms. I was the 4:45 group leader but usually headed out with Lori, the 4:30 group leader since my group consisted of only one other runner. It was just what I needed, I loved the experience. When I had to do my last long run for my marathon, I asked for people to run with me and I had plenty of runners to run with, I only had to do 7k on my own. This kind of support makes such a difference. 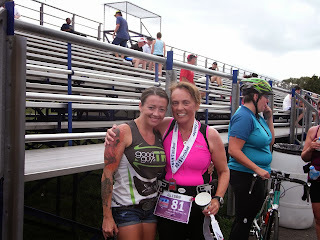 My friend Barbara can through big time for me this summer, I asked her to run the half marathon portion of my Half Iron Distance Triathlon with me...and she did! She was instrumental in getting me across the finish line, she kept me going when I was struggling, and there were a few of those portions and she helped me finish before my goal time of 7:30. 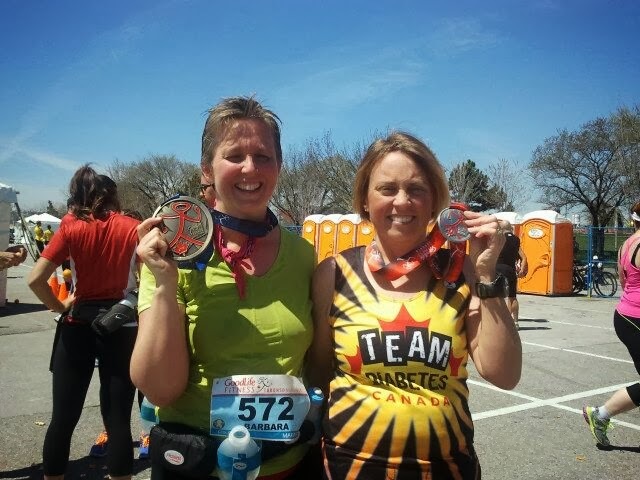 This year Barbara and I traveled to Toronto together for her first marathon and my half, she ran my first Half Iron distance tri with me and next we tackle the Goofy together. Barbara and I running together, another loop done. Words can not express my gratitude and thank you does not seem enough, you are my running hero and my friend, my life is richer for having you in it Barbara. As 2013 closes out, I will have run almost 1100 miles or 1830km, I will have bike almost 900 miles or 1500 km and swam countless laps and km, too many to count. I am 15 pounds lighter then last year and in a much happier place personally and with my training. I am looking forward to 2014 and the races I have planned, first up the Goofy on Jan 11 and 12th. This year I proved to myself that I am a runner and triathlete, that I am worthy.